My dad was born and raised in Tehran, Iran. In the 1960s, he emigrated to the U.S., and soon after my grandparents and uncles followed. When I was a kid, every Sunday my dad would cook up a Persian feast—rice dishes, stews, sometimes rose water-enhanced desserts. My grandmother would help. She only spoke Farsi, so communicating with her entailed a lot of smiling and nodding (oddly, she knew how to say “Al Bundy” from watching Married With Children). What is Persian food? It’s not exactly Mediterranean food—olive oil, hummus, tabbouleh, falafel, pasta, and wine aren’t part of the cuisine. Persian food owes its diversity to The Silk Road, which ran through what is now Iran. Pomegranates and pistachios were indigenous to the region and exported. In return, traders brought in rice from India and China, tomatoes from the Ottoman Empire, turmeric from India, yogurt from Central Asia, feta from Greece, saffron from Crete, and lamb from the Arabs. I describe Persian cuisine as an amalgam of Far East and Middle Eastern accents, with some eastern Mediterranean inspiration. Before and since my dad passed away, my American mom picked up on Persian cooking. In my eyes, she’s an expert, and her food easily rivals anything found in restaurants. Like a lot of Iranians, she’ll spend days making the food for our family. Persians are loving and warm people who are always happy to brew you a cup of Persian tea, or cook you a feast, resulting in leftovers for a week. What is Persian tea and coffee? There is no such thing as going to the market and buying a bag of tea labeled “Persian tea.” Iranians enjoy Earl Grey, mixed with Darjeeling or Ceylon tea. Earl Grey’s bergamot gives the drink its perfumed smell and flavor. To brew the tea (chai, pronounced exactly like the Southeast Asia drink), you’ll need a teapot, ideally a glass mug, a tea kettle, and if you’re fancy, a Russian-style samovar. Boil water and rinse a glass with it so the tea will keep warm. Brew the tea in the pot, but to keep the water warm, stow the teapot on top of the kettle. This is a MacGyver-like trick to making tea if you don’t have a samovar (I don’t). Iranians drink tea for breakfast—and lunch, dinner, and after dinner—served with nan (flat bread), rock candy, and nuts like pistachios. Feel free to add some cardamom pods or a drop of rose water to the tea to give it a floral essence, but it’s not necessary. Take a sugar cube and either place it in your mouth and drink the tea, or plop it into the cup. Iran outlawed alcohol, but if you drink several cups of strong tea, you might feel some boozy effects. Fun fact: Coffee was the main warm drink in Iran starting in the ninth century, but in the 1800s an Iranian merchant brought tea to Persia from India. Henceforth, tea eclipsed coffee drinking. Though, Iranians still drink coffee—traditional Persian coffee is thick and strong like Turkish coffee, and might have cardamom added to the brewing process. Shami is essentially a meat and legume patty. For some reason it doesn’t seem to appear on many restaurant menus, which is a shame because it’s my favorite Persian food. You can use ground beef, lamb, chicken, or make it wholly vegetarian. Add spices like cinnamon, paprika, saffron, turmeric, plus split peas or chickpeas, and eggs together in a food processor. My mom goes off recipe and soaks two slices of bread in milk, rings them out, and throws them into the processor, just to give the patty a bit more moisture. She also adds cooked potatoes, lemon juice, and a chopped apple. Once mixed together, form round, flat patties, roll them in flour, then egg yolk and panko crumbs, and fry in olive or canola oil until they’re slightly crispy. If you don’t want it fried, you can also bake the patties. Serve the patties with nan and yogurt. Though comparable to a hamburger patty, shami doesn’t require a bun, vegetable, and condiment assembly like American hamburgers. Chelo is the word for steamed rice, and it’s served with many, many dishes. Usually, food will be plated on top of a bed of fluffy rice, or the rice will be mixed in with other ingredients, which is called polo. The closest analog to Persian rice widely available in the U.S. is the long-grained basmati. Making good Persian rice can be painstaking and time consuming, and the mark of a deft rice-maker is whether the person can produce a golden-brown tahdig. This is the crispy bottom layer of rice that sticks to the bottom of the pot. It’s a bit like paella, but the pot is coated with yogurt and butter, so in addition to crunch, there’s also a rich tangy flavor to the tahdig. Certain rice dishes may also include barberries, pomegranate, and sour cherries, which again, underscore the sweet-sour dynamic prevalent in Persian cuisine. Yogurt is ubiquitous in Perisan dishes. According to Persian Cookery by Nassrollah Islami, “Yogurt is considered the panacea for human ills, and the Persians’ long life is attributed to it.” A popular application of yogurt is in a drink called doogh (pronounced “duke”). Take some yogurt (preferably a thin yogurt but Greek yogurt will do) and mix in a pitcher with dried mint, salt, and either flat or carbonated water. Persians pair doogh with kebabs, and drink it to cool down in the summer. In Louisa Shafia’s cookbook The New Persian Kitchen, she writes: “By most accounts, kebabs originated in Iran. Persian soldiers and nomads discovered that cooking small chunks of meat over a fire was fast and fuel-efficient.” Centuries ago, Persians consumed ox, duck, pigeon, and ostrich as forms of protein. Today, kebabs are made from lamb, chicken, fish, beef, and for the more adventurous, lamb liver, heart, and kidney kebabs (sometimes all on one skewer). Unlike the spinning meat wheels of Lebanon and Turkey, kebabs are cooked on skewers. Kebab-e barg means the meat is a fillet, and kubideh means the meat is ground. These cooked meats are placed atop a pile of fluffy rice and sprinkled with saffron or the lemon-like sumac. 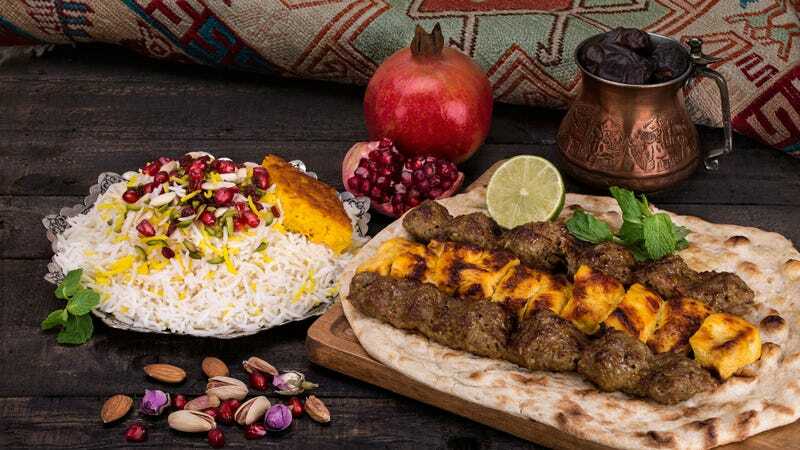 It should be noted that Iranians aren’t huge red meat eaters—they think too much throws their body off balance—but they do enjoy the occasional kebab, served with rice, a side of raw onion and blistered tomatoes. Ghormeh sabzi is a type of stew cooked with lamb, but it can also be made meatless. Dried Persian limes, parsley, cilantro, fenugreek leaves, green onions, kidney beans, and sometimes spinach and tofu (lots of global influence in modern Persian cooking!) simmer together on the stovetop. The forest-green stew is then served over rice. For the health-conscious Iranians, herbs play a significant part in their cooking. During the Persian New Year of Nowruz (March 21), various herbs are displayed to represent spring rebirth. Iranians don’t have a traditional salad, but sabzi khordan is the closet. It’s a plate comprised of feta cheese, herbs such as mint and basil, plus radishes and walnuts served at the beginning of the meal. Herbs in general are not employed as a garnish but instead as main ingredients. As seen in ghormeh, herbs heighten the dish, and so does the astringency and bitterness from dried Persian limes—a taste that marries a lemon and a key lime. Fesenjan’s usage of pomegranate molasses (alongside ground walnuts and chicken) makes it the tartest of the Persian stew, and illustrates the sourness we love so much. Ash is the Persian word for soup, which differs from stew in that it’s not as thick as stew but also not brothy. Pomegranate soup ash-e reshteh (noodle and beef), lentil soup, and barley soups are popular. For Iranians, soups symbolize several things: They are served during weddings and special occasions, acting as a means to forge new friendships. When one wants a wish to come true, friends and families come together and make a soup called “beggar’s soup,” hoping the wish will come to fruition. The soups are also prepared ahead of long journeys, and when someone is sick the community will cook “charity soup” for the ill.
Persians don’t eat a lot of desserts unless it’s for a special occasion—they prefer to end their meals with fresh and dried fruits and nuts. But they do make a variety of baked goods, which feature nuts, rose water, and saffron. We love baklava (acquired from the Turks), the spreadable confection known as halva (butter, flour, sugar, water, saffron), rose water ice cream with vermicelli noodles strewn on top, a Persian sugar cookie called nane shirini, and an almond brittle made with rose water, saffron, and pistachios. What are some good Persian cookbooks? The book I’d direct you to first is Najmieh Batmanglij’s New Food of Life, first published in 1986. (She is the mother of Zal Batmanglij, the co-creator of Netflix show The OA, and Rostam, former keyboardist for Vampire Weekend.) Her 447-page book contains 250 recipes, most of which are long and complicated. She includes a lot of good tips, and weirder recipes for things like tongue and that aforementioned lamb liver kebab. For simpler and healthier recipes, turn to 2013’s The New Persian Kitchen, by Louisa Shafia (watch her Google Talk above). She nixes butter and salts for coconut oil and clarified butter, and adds quinoa instead of rice to a few dishes. For vegans, she even has a recipe for tempeh kebab, and a good recipe for grilled ears of corn, which are dunked in salt water after grilling. She also goes into great detail about how Persians pickle vegetables and can preserves. Hers is a fresh and modern take on the cuisine while still rooted in the past. Persian Cookery is a slim, pocket-sized paperback book with easy-to-follow recipes. The only caveat is since it was published in the 1960s, author Nassrollah Islami constantly references the “Persian housewife” and writes sexist things like, “If you watch your husband’s stomach, he will be harmless as a lamb.” Um, yeah. Typically, when you dine with Iranians, you’re supposed to sit on the floor (my family doesn’t do this) or at \a table covered with a cloth. Everyone eats family-style. “Nush-e jan” is the Farsi word for “bon appétit” and should be announced before everyone digs in. “Salamati” means “cheers” or “to your health,” and is said while drinking tea or other beverages. You don’t need to bring a gift, but roasted pistachios are always welcomed. Garin is the author of The Beer Cheese Book and Rebels and Underdogs: The Story of Ohio Rock and Roll. Besides food and music, she also really likes cats.